Marlo modern end table features a polished stainless steel base and a clear tempered glass surface. The Marlo has a very unique design with the base and the frame going true the glass and the main surface area floating in between the frame. The Marlo is definitely a unique statement piece for the modern living room. Width: 19.5" | Depth: 19.5" | Height: 30"
Float Modern Rectangular Coffee Table has a 12mm tempered clear glass and a silver polished stainless-steel base with a brush painted steel base. 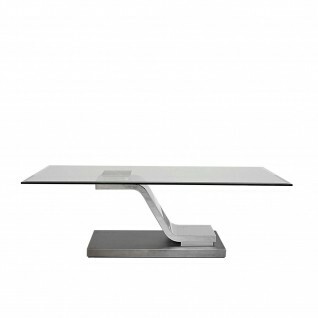 Onyx Luxury Collection offers Coffee Table with a silver polished stainless-steel base and vaCF541:CG556ions. 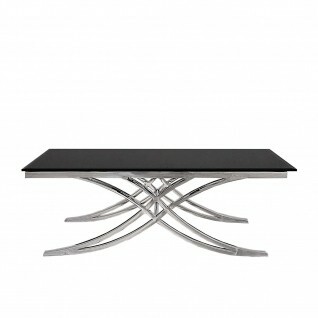 Valora Modern Rectangular Coffee Table has a 12mm tempered black glass top with silver polished stainless-steel base. Flow Luxury Coffee Table features a rose gold polished stainless-steel base with variation of table top options. AllaModa Furniture is an up & coming furniture store that sells the latest modern and contemporary styles.